West Hills, New York, U.S. In 1929, President Hoover appointed Stimson as Secretary of State. Stimson sought to limit worldwide naval build-up and helped negotiate the London Naval Treaty to that end. He protested the Japanese invasion of Manchuria, instituting the Stimson Doctrine of non-recognition of international territorial changes that were executed by force. After World War II broke out in Europe, Stimson accepted Roosevelt's appointment to the position of Secretary of War. After the United States entered World War II, Stimson took charge of raising and training 13 million soldiers and airmen, supervised the spending of a third of the nation's GDP on the Army and the Air Forces, helped formulate military strategy, and oversaw the Manhattan Project, which built the first atomic bombs. He supported the atomic bombings of Hiroshima and Nagasaki. During and after the war, Stimson strongly opposed the Morgenthau Plan, which would have de-industrialized and partitioned Germany into several smaller states. He also insisted on judicial proceedings against Nazi war criminals, leading to the Nuremberg trials. Stimson retired from office in September 1945 and died in 1950. Henry Lewis Stimson was born in Manhattan, New York City, the son of Lewis Atterbury Stimson, a prominent surgeon, and his wife, the former Candace Thurber Wheeler. When he was nine his mother died of kidney failure, after which he was sent to boarding school. He spent summers with his grandmother Candace Wheeler at her Catskills country house, playing with his nephew Dunham Wheeler, almost the same age, in "the Armory" - their nickname for one corner of a large room in the house. Roaming the Catskills mountains he grew to love the outdoors and would become an avid sportsman. He was educated at Phillips Academy in Andover, Massachusetts, where he gained a lifelong interest in religion and a close relationship with the school and ultimately donated Woodley, his Washington DC real estate to the school in his will (the property is now the Maret School). He was an honorary lifetime member of Theodore Roosevelt's Boone and Crockett Club, North America's first wildlife conservation organization. He was a Phillips trustee from 1905 to 1947, serving as president of the board from 1935 to 1945. He then attended Yale College where he was elected to Phi Beta Kappa. He joined Skull and Bones, a secret society that afforded many contacts for the rest of his life. He graduated in 1888 and attended Harvard Law School, graduating in 1890, and joined the prestigious Wall Street law firm of Root and Clark in 1891. He became a partner in 1893. Elihu Root, a future Secretary of War and Secretary of State, became a major influence on and role model for Stimson. In July 1893, Stimson married the former Mabel Wellington White, a great-great granddaughter of American founding father Roger Sherman and the sister of Elizabeth Selden Rogers. An adult case of mumps had left Stimson infertile and they had no children. In 1906, President Theodore Roosevelt appointed Stimson U.S. Attorney for the Southern District of New York. Here, he made a distinguished record prosecuting antitrust cases. Stimson later served from 1937 to 1939 as president of the New York City Bar Association, where a medal honoring service as a U.S. Attorney is still awarded in his honor. In 1911, President William Howard Taft appointed Stimson Secretary of War. He continued the reorganization of the Army begun by Elihu Root, improving its efficiency prior to its vast expansion in World War I. In 1913, following the accession of President Woodrow Wilson, Stimson left office. Following the outbreak of World War I in 1914, he was a strong supporter of Britain and France, but also supported the nation's neutrality policy. He called for preparation of a large, powerful army and was active in the privately funded Plattsburg Training Camp Movement to train potential officers. When war came in 1917 Stimson was one of eighteen officers selected by former President Theodore Roosevelt to raise a volunteer infantry division, Roosevelt's World War I volunteers, for service in France in 1917. President Woodrow Wilson refused to make use of the volunteers and the unit disbanded. Stimson served the regular U.S. Army in France as an artillery officer, reaching the rank of colonel in August 1918. He continued his military service in the Organized Reserve Corps, rising to the rank of brigadier general in 1922. In 1927, Stimson was sent by President Calvin Coolidge to Nicaragua to negotiate an end to the civil war taking place there. Stimson wrote that Nicaraguans "were not fitted for the responsibilities that go with independence and still less fitted for popular self-government" He opposed Filipino independence for the same reason, after he had been appointed Governor-General of the Philippines, an office he held from 1927 to 1929. Stimson returned to the cabinet in 1929, when President Herbert Hoover appointed him Secretary of State. Both served until 1933. Stimson lived in the Woodley Mansion in Washington, D.C. and lived there until 1946. In 1930-31, Stimson was the Chairman of the U.S. delegation to the London Naval Conference of 1930. In the following year, he was the Chairman of the U.S. delegation to World Disarmament Conference in Geneva. That same year, the United States issued the "Stimson Doctrine" as a result of the Japanese invasion of Manchuria: the United States refused to recognize any situation or treaty that limited U.S. treaty rights or that was brought about by aggression. Returning to private life at the end of Hoover's administration, Stimson was an outspoken advocate of strong opposition to Japanese aggression. After World War II broke out in Europe, President Franklin D. Roosevelt returned Stimson to his post at the head of the War Department. The choice of Stimson, a conservative Republican, was a calculated effort by the president to win bipartisan support for what was considered an almost inevitable US entrance into the war. 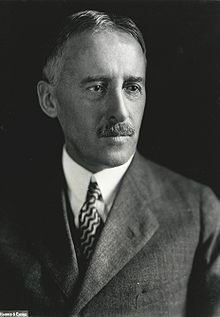 Ten days before the Attack on Pearl Harbor, Stimson entered in his diary the following statement: "[Roosevelt] brought up the event that we are likely to be attacked perhaps next Monday, for the Japanese are notorious for making an attack without warning, and the question was what we should do. The question was how we should maneuver them into the position of firing the first shot without allowing too much danger to ourselves." During the war, Stimson oversaw a great expansion of the military including the conscription and training of 13 million soldiers and airmen, and the purchase and transportation of 30% of the nation's industrial output to battlefields. He worked closely with his top aides Robert P. Patterson (who succeeded Stimson as Secretary), Robert Lovett (who handled the Air Force), Harvey Bundy and John J. McCloy (Assistant Secretary of War). Stimson was initially opposed to the mass removal of Japanese Americans from the West Coast, but he would eventually give in to pro-exclusion military advisers and secure Roosevelt's final approval for the incarceration program. The administration was split in the wake of Pearl Harbor, with Justice Department officials arguing against "evacuation" on one side and Army and War Department leaders demanding immediate relocation on the other. At this point still opposed to the idea of wholesale eviction, Stimson spent much of January 1942 fielding calls from military advisers and West Coast politicians on the potential threat of Japanese American fifth columnists. By February, John McCloy and others from the pro-exclusion camp had won him over. On February 11, Stimson and McCloy briefed the President in a phone conference; Roosevelt gave his Secretary of War the go-ahead to pursue whatever course he saw fit, and McCloy contacted Karl Bendetsen to begin formulating a removal strategy immediately after. Roosevelt granted Stimson final approval to carry out the eviction of West Coast Japanese Americans on February 17, and two days later Executive Order 9066 authorized the establishment of military zones excluding certain persons. As the Western Defense Command began circulating civilian exclusion orders, a new debate formed regarding Japanese Americans in the then-territory of Hawaii. Stimson joined other officials to push for the exclusion of all "enemy alien" Japanese from the Islands. (Japanese immigrants were prohibited by law from naturalization and were therefore classified as enemy aliens regardless of their residential status.) However, Japanese Hawaiians were the largest ethnic group in the territory and the foundation of the Island's labor force; mass removal was infeasible both economically and politically, and Stimson's proposal quickly fell through. Although Stimson believed it was "quite impossible" to determine the loyalty of Japanese Americans and eventually came to support the army's incarceration program, he remained unconvinced on the legality of the policy: "The second generation Japanese can only be evacuated either as part of a total evacuation, giving access to the areas only by permits, or by frankly trying to put them out on the ground that their racial characteristics are such that we cannot understand or trust even the citizen Japanese. The latter is the fact but I am afraid it will make a tremendous hole in our constitutional system." Stimson authorized the release of Japanese Americans from camp in May 1944, but postponed allowing them to return to the West Coast until after the November elections to avoid controversy in Roosevelt's upcoming campaign. On November 21, 1943, the news broke that General George S. Patton, commander of the U.S. Seventh Army, had slapped an enlisted man suffering from nervous exhaustion at a medical evacuation hospital in Sicily. The incident caused a storm of controversy, and members of Congress called for Patton to be relieved of command. General Dwight D. Eisenhower opposed any move to recall General Patton from the European theater saying privately, "Patton is indispensable to the war effort - one of the guarantors of our victory." 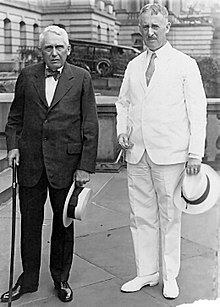 Stimson and McCloy agreed; Stimson told the Senate that Patton would be retained because of the need for his "aggressive, winning leadership in the bitter battles which are to come before final victory". Stimson strongly opposed the Morgenthau Plan to de-industrialize and partition Germany into several smaller states. The plan also envisioned the deportation and summary imprisonment of anybody suspected of responsibility for war crimes. Initially, Roosevelt had been sympathetic to this plan, but later, due to Stimson's opposition and the public outcry when the plan was leaked, the President backtracked. Stimson thus retained overall control of the U.S. occupation zone in Germany, and although the Morgenthau plan did influence the early occupation, it never became official policy. Explaining his opposition to the plan, Stimson insisted to Roosevelt that ten European countries, including Russia, depended upon Germany's export-import trade and production of raw materials and that it was inconceivable that this "gift of nature", populated by peoples of "energy, vigor, and progressiveness", should be turned into a "ghost territory" or "dust heap". What Stimson most feared, however, was that a subsistence-level economy would turn the anger of the German people against the Allies and thereby "obscure the guilt of the Nazis and the viciousness of their doctrines and their acts". Stimson pressed similar arguments on President Harry S. Truman in the spring of 1945. Stimson, a lawyer, insisted — against the initial wishes of both Roosevelt and Churchill — on proper judicial proceedings against leading war criminals. He and the United States Department of War drafted the first proposals for an International Tribunal, and this soon received backing from the incoming President Truman. Stimson's plan eventually led to the Nuremberg Trials of 1945–1946 that have had a significant impact on the development of International Law. 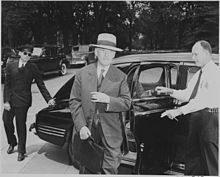 Stimson arriving for a Truman cabinet meeting in August 1945. As Secretary of War, Stimson took direct personal control of the entire atomic bomb project, with direct supervision over General Leslie Groves, head of the Manhattan Project. Both Roosevelt and Harry S. Truman followed Stimson's advice on every aspect of the bomb, and Stimson overruled military officers when they opposed his views. The Manhattan Project was managed by Major General Groves (Corps of Engineers) with a staff of reservists and many thousands of civilian scientists and engineers. Nominally Groves reported directly to General George Marshall, but in fact Stimson was in charge. Stimson secured the necessary money and approval from Roosevelt and from Congress, and made sure Manhattan had the highest priorities. He controlled all planning for the use of the bomb. Stimson wanted "Little Boy" (the Hiroshima bomb) dropped within hours of its earliest possible availability — it was; Japan was to be forced to surrender and the bombing of Hiroshima August 6 would likely be a finishing blow for Tokyo. Stimson would ultimately conclude that if the United States had guaranteed the Japanese that they would retain their Emperor, they might have surrendered, making the use of atomic bombs unnecessary. In retrospect historians debate whether the impact of continued blockade, relentless bombing, and the Russian invasion of Manchuria would have somehow forced the Emperor to surrender sometime in late 1945 or early 1946 even without the atomic bombs (though not without very large numbers of allied casualties). Stimson looked beyond the immediate end of the war. He was the only top government official who tried to predict the meaning of the atomic age—he envisioned a new era in human affairs. For a half century he had worked to inject order, science, and moralism into matters of law, of state, and of diplomacy. The impact of the atom bomb, he thought, would go far beyond military concerns to encompass diplomacy and world affairs, as well as business, economics and science. Above all, said Stimson, this "most terrible weapon ever known in human history" opened up "the opportunity to bring the world into a pattern in which the peace of the world and our civilization can be saved". That is, the very destructiveness of the new weaponry would shatter the ages-old belief that wars could be advantageous. It might now be possible to call a halt to the use of destruction as a ready solution to human conflicts. Indeed, society's new control over the most elemental forces of nature finally "caps the climax of the race between man's growing technical power for destructiveness and his psychological power of self-control and group control--his moral power". In 1931, when Japan invaded Manchuria, Stimson, as Secretary of State, proclaimed the "Stimson Doctrine". It said no fruits of illegal aggression would ever be recognized by the United States. Japan ignored it. Now, according to Stimson, the wheels of justice had turned and the "peace-loving" nations (as Stimson called them) had the chance to punish Japan's misdeeds in a manner that would warn aggressor nations never again to invade their neighbors. To validate the new moral order, he believed that the atomic bomb had to be used against combatants and war workers; Hiroshima and Nagasaki both in fact contained combatant bases and major centers of war industry employing tens of thousands of civilians. The question for Stimson was not one of whether the weapon should be used or not. Involved was the simple issue of ending a horrible war, and the more subtle and more important question of the possibility of genuine peace among nations. Stimson's decision involved the fate of mankind, and he posed the problem to the world in such clear and articulate fashion that there was near unanimous agreement mankind had to find a way so that atomic weapons would never be used again to kill people. 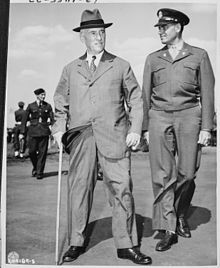 Stimson officially announced his retirement on September 21, 1945. Afterwards, he wrote his memoirs with the aid of McGeorge Bundy. On Active Service in Peace and War was published by Harper in 1948 to critical acclaim. It is often cited by historians, as are the 170,000 typed pages of candid diaries that Stimson dictated at the end of every day. [according to whom?] The diary is now in the Yale University Library; parts have been published in microfilm. Two months after leaving office, in November 1945, Stimson suffered a heart attack from which he recovered, although he suffered a speech impediment. In the summer of 1950, Stimson fell and broke his leg, after which he was confined to a wheelchair. On October 20, one month after his 83rd birthday, he succumbed to complications from a second heart attack. Stimson died at his estate Highhold in West Hills, New York. He is buried in the adjacent town of Cold Spring Harbor, in the cemetery of St. John's Church. Mount Stimson in Montana's Glacier National Park is named after Stimson, who in the 1890s hiked and assisted George Bird Grinnell in surveying the area and later supported creating the park. The Henry L. Stimson Center, a private research institute in Washington, DC, advocates what it says is Stimson's "practical, non-partisan approach" to international relations. The Benjamin Franklin-class ballistic missile submarine USS Henry L. Stimson (SSBN-655) was commissioned in 1966. Stimson's name graces the Henry L. Stimson Middle School in Huntington Station, Long Island; a residential building on the campus of Stony Brook University; as well as a dorm at his alma mater Phillips Academy. Stimson is also commemorated by the New York City Bar Association, where he served as President from 1937 to 1939, with the Henry L. Stimson Medal. The medal is awarded annually to outstanding Assistant U.S. Attorneys in the Southern and Eastern Districts of New York. Stimson has been portrayed in nearly a dozen movies and television shows about World War II and its aftermath, including Manhattan (2014-2015), Truman (1995), Truman at Potsdam (1995), Fat Man and Little Boy (1989), Day One (1989), War and Remembrance (1988), Race for the Bomb (1987), Churchill and the Generals (1981), Oppenheimer (1980), Tora! Tora! Tora! (1970), and The Beginning or the End (1947). In the alternate history short story "Truth, Justice, and the American Way" by Lawrence Watt-Evans contained in Alternate Presidents, Stimson succeeded Hoover as President in 1936, defeating Roosevelt. He once again defeated Roosevelt in 1940. ^ Amelia Peck and Carol Irish (2001). Candace Wheeler: The Art and Enterprise of American Design. Metropolitan Museum of Art, New York. p. 88. ISBN 978-1-58839-002-8. ^ "Stimson Estate Goes to Phillips Academy". The Milwaukee Journal. 1938-05-15. p. 13. Retrieved 2014-02-06. ^ Henry L. Stimson: The First Wise Man. Wilmington, Delaware: Scholarly Resources Inc. 2001. p. 4. ISBN 978-0842026314. Retrieved 2014-02-06. ^ "Phillips Academy - Notable Alumni: Short List". Phillips Academy. Archived from the original on 2016-10-27. Retrieved 2014-02-06. ^ Sean L. Malloy (2008). Atomic Tragedy: Henry L. Stimson and the Decision to Use the Bomb Against Japan. Cornell University Press. pp. 14–15. ISBN 978-0801446542. ^ see Malloy, Ch. 1, "The Education of Henry L. Stimson"
^ Conant, Jennet (2002). Tuxedo Park. Simon & Schuster. p. 24. ISBN 978-0-684-87287-2. ^ "Henry Lewis Stimson". U.S. Army Center of Military History. Retrieved 5 January 2017. ^ David F. Schmitz, Henry L. Stimson: the first wise man (2001) p 55. ^ David F. Schmitz, Henry L. Stimson: the first wise man (2001) p 69. ^ "Gentlemen Reading Each Others' Mail: A Brief History of Diplomatic Spying". The Atlantic Magazine. 2013. Retrieved 2019-04-13. ^ Herman, Arthur. Freedom's Forge: How American Business Produced Victory in World War II, pp. 83-4, 90, 94, 112-15, 121, 125-6, 139, 141, Random House, New York, NY, 2012. ISBN 978-1-4000-6964-4. ^ a b c Niiya, Brian. "Henry Stimson". Densho Encyclopedia. Retrieved 15 October 2014. ^ Scheiber, Jane L.; Scheiber, Harry N. "Martial Law in Hawaii". Densho Encyclopedia. Retrieved 15 October 2014. ^ Hodgson, Godfrey. The Colonel: The Life and Wars of Henry Stimson, 1867-1950 (New York: Knopf, 1990), p 259. ^ Atkinson, Rick, The Day of Battle: The War in Sicily and Italy 1943-1944, New York: Henry Holt & Co., ISBN 978-0-8050-8861-8 (2007), p. 147. ^ Beschloss, Michael R. (2003-10-07). Morgenthau-Plan. ISBN 9780743244541. Retrieved 2014-07-20. ^ "Henry Lewis Stimson". Archived from the original on 2010-06-11. Retrieved 2011-06-20. ^ Art, Robert J.; Waltz, Kenneth Neal (2004). The Use of Force: Military Power and International Politics. Rowman & Littlefield. p. 179. ISBN 9780742525573. ^ David F. Schmitz, Henry L. Stimson: the first wise man (2001) p 153. ^ "Revisionists" who reject use of the bomb include Gar Alperovitz, The Decision to Use the Atomic Bomb (1996) and Barton J. Bernstein (1993). ""Seizing the Contested Terrain of Early Nuclear History: Stimson, Conant, and Their Allies Explain the Decision to Use the Atomic Bomb," Diplomatic History 17 (Winter 1993): 35-72". Diplomatic History. 17: 35–72. doi:10.1111/j.1467-7709.1993.tb00158.x. ^ Henry Stimson to Harry S. Truman, accompanied by a memorandum, September 11, 1945. Truman Papers, President's Secretary's File. Atomic Bomb. ^ Top Secret Letter From Henry Stimson, Secretary of War 24 April 1945. Retrieved 31 December 2018. ^ "The Diaries of Henry Lewis Stimson in the Yale University Library". Microformguides.gale.com. 1945-09-21. Retrieved 2014-07-20. ^ Universal Press Syndicate (Nov 13, 1945). "Stimson Recovering from Heart Attack". Pittsburgh Press. Retrieved 2014-01-23. ^ "Henry L. Stimson Dies at 83 In His Home on Long Island". New York Times. October 21, 1950. Retrieved 2014-01-23. ^ "Henry L. Stimson, 83, Dies on LI, Served Nation in Four Cabinets". Newsday. October 21, 1950. p. 2. ^ "Memorial Cemetery, St. John's Church". Retrieved October 20, 2016. ^ "St. John's Church Memorial Cemetery". Oldlongisland.com. Retrieved 13 October 2017. ^ "Public Papers Harry S. Truman 1945-1953". Trumanlibrary.org. Retrieved 13 October 2017. ^ "Distinguished Service Medal Recipients - Page 9 - The American Legion". Legion.org. Retrieved 13 October 2017. ^ "About Stimson | The Stimson Center | Pragmatic Steps for Global Security". Stimson.org. Retrieved 2013-06-10. Gerber, Larry G. "Stimson, Henry Lewis"; American National Biography Online February 2000. Gerber, Larry G. The Limits of Liberalism: Josephus Daniels, Henry Stimson, Bernard Baruch, Donald Richberg, Felix Frankfurter and the Development of the Modern American Political Economy (1983). Wikimedia Commons has media related to Henry Lewis Stimson. This page was last edited on 22 April 2019, at 01:29 (UTC).